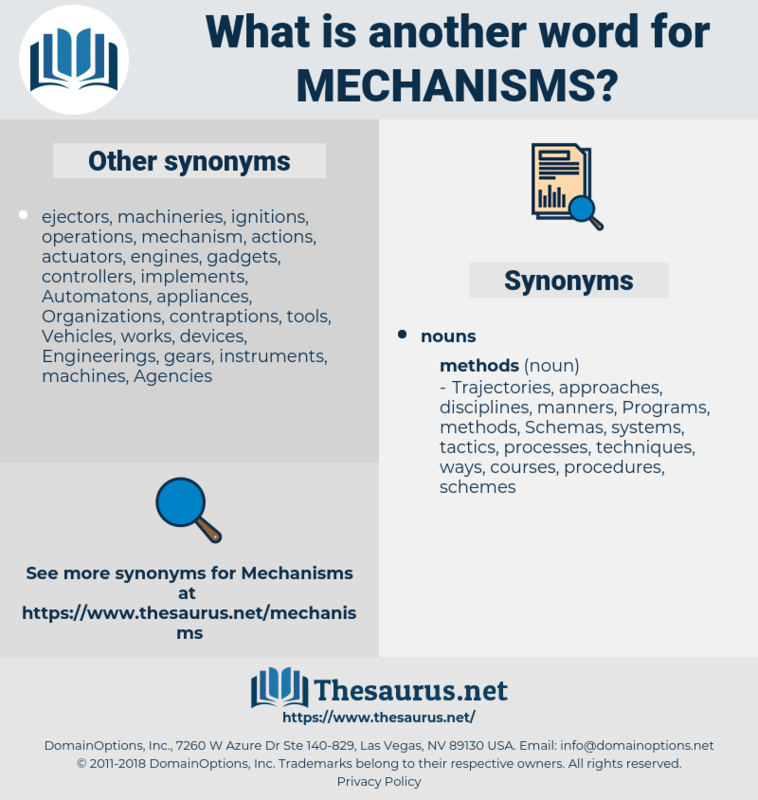 What is another word for mechanisms? machines, conditions, techniques, factors, operations, provisions, terms, appliances, tools, Vehicles, solutions, engines, NPMS, jurisdictions, assets, packages, Capabilities, Resources, Companies, points, role, rules, modalities, sectors, states, grounds, Guards, Rights, nations, NMS, Opportunities, courts, practices, options, machineries, Facilities, schemes. Measures, Enhancing, regulation, c., management, practices, options, a., minister, charter, department, modified, des, kyoto, heritage, RBM, regional, redress, national, university, machineries, controls, canada, public, facility, Facilities, scheme, schemes. 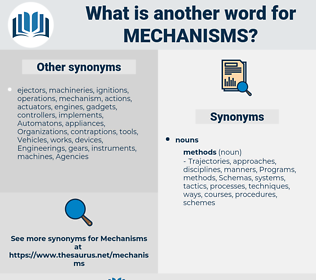 channels, machines, principles, conditions, techniques, mechanical, Schemas, Measurements, organisms, agreements, chains, partnerships, factors, operations, Phenomena, components, Recommendations, frameworks, provisions, issues, steps, initiatives, mandate-holders, patterns, requirements, matters, implements, Consultations, terms, Instrumentalities, aspects, appliances, economics, controllers, mode, modes, linkages, tools, sources, disciplines, actions, cooperation, alternatives, causes, premises, elements, Apparatuses, Vehicles, installations, PATHWAYS, details, outcomes, solutions, media, models, strategies, engines, Regulations, NPMS, restraints, Incentives, complaints, pieces, jurisdictions, documents, WINDOWS, Entities, assets, acts, types, packages, exists, conventions, services, Standards, checks, flexfields, laws, settings, cases, levers, Capabilities, Deficiencies, functions, platforms, applications, courses, item, items, clauses, enterprises, appropriations, wheels, fabrics, enablers, mandates, things, corporations, agents, fuses, dispositifs, Exercises, streams, stakeholders, inputs, aids, Possibilities, programmes, rapporteurs, balances, Resources, objectives, kinds, projects, partners, CRMS, Paths, protections, disputes, scan, monitors, Activities, plans, decisions, Companies, points, actuators, Policies, providers, links, Treaties, fittings, Areas, avenues, Programs, technologies, benefits, questions, rules, Operators, Remedies, modalities, developments, materials, parts, aircraft, Styles, forces, sectors, traditional, terrain, gearboxes, Incubators, safeguards, spaces, venues, departments, Governments, pleas, nets, Tracks, Efforts, defenses, lamps, routes, peoples, waterways, conflicts, fixtures, Movements, LANES, support, supports, states, tribunals, planes, Forms, skills, women, funds, grounds, needs, Populations, Ones, actors, Formulas, Guards, results, levels, units, data, roads, features, advantages, pyeong, change, changes, offices, accounts, sets, works, Rights, events, Motions, Bureaus, groups, Firms, problems, officials, From, norms, priorities, trucks, Opportunities, flows, pyong, text, courts, auditors, Measures, Parties, LINEs, practices, options, regimes, machineries, controls, Facilities, schemes, instruments. combination, co-ordination, inadequacy, landscape, prevalence, overview, channel, set-up, way. ensuring, monitoring, operating, reporting, Including, working, conducting, setting, developing, making. strengthened, described, Been, established, used, presented, proposed, accepted, needed, adopted, deprived. supports, Measures, regimes, machineries, controls. systems, instances, Forums, defences, Fora. The human brain is made, like every brain, to set up motor mechanisms and to enable us to choose among them, at any instant, the one we shall put in motion by the pull of a trigger. And their shifting mechanisms were imperative! mesenchyme, misoneism, misogynism, machine gun, mycomycin, magnesium, maxim gun, Manichaeanism, making known, Mise En Scene.